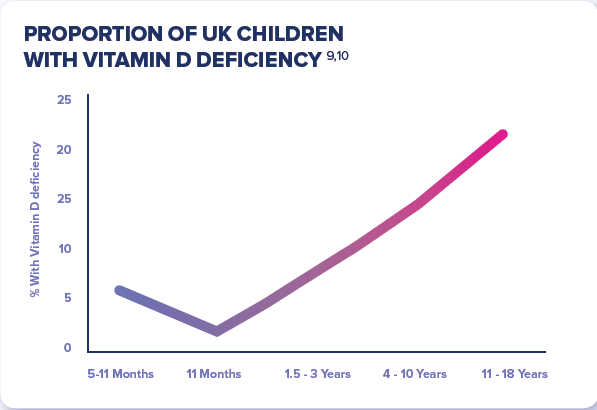 In 2016, the Scientific Advisory Committee on Nutrition (SACN)(5) produced a report which recommended that everyone over the age of four years should aim to consume 10 micrograms of vitamin D daily. The full recommendations are given in the table below. Safe intakes are set when there is insufficient evidence to set a Reference Nutrient Intake; defined as the intake needed to ensure that 97.5% of the population meet their nutrient requirement. Health visitors and other community practitioners can have a positive impact on vitamin D status in families with babies and young children by identifying those who are at risk, and by delivering appropriate advice on sun exposure, diet and supplementation, helping to promote a healthy lifestyle from birth. 1. Bates et al. (2016) National Diet and Nutrition Survey. Results from years 5 and 6 (combined) of the Rolling Programme. London: PHE/FSA. 2. European Commission (2012) Commission Regulation (EU) No 432/2012 establishing a list of permitted health claims made on foods, other than those referring to the reduction of disease risk and to children’s development and health. Official Journal of the European Union L136: 1–40. 4. Ruxton CHS, Derbyshire E (2009). Health impacts of vitamin D: are we getting enough? Nutrition Bulletin 34: 185–197. 7. Ruxton CHS (2011). The benefits of fish consumption. Nutrition Bulletin 36: 6-19. 9. Bates et al. (2014) National Diet and Nutrition Survey. Results from years 1 to 4 (combined) of the Rolling Programme. London: PHE/FSA.